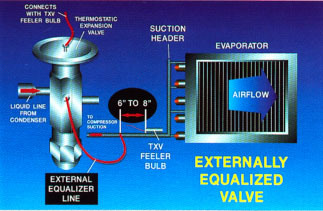 Thermostatic expansion valve shown previously called internally equalized valves, because the pressure in the evaporator on the bottom of the diaphragm inside valve. 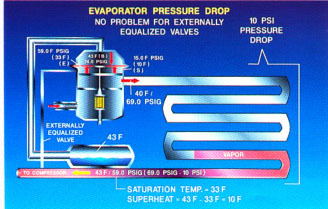 This pressure is the pressure at the inlet of the evaporator. Since there is resistance to the flow of the refrigerant passes through the evaporator outlet pressure is always lower than the input. This means that the saturation temperature at the evaporator output will also be higher than the input. When the pressure drop in the evaporator becomes significant, it becomes difficult to maintain the desired temperature of overheating. Imagine the following situation. The pressure at the inlet of the evaporator-69.0 pounds per square inch. This corresponds to the saturation temperature 40F. If the coil had refrigerant pressure drop, as previously believed, the valve would nicely maintain 10F overheating exit. If 10 PSI pressure drop of the refrigerant through the coil, however, " real " is not overheating 10F. 50F REFRIGERANT gas overheats 10F when measured pressure in the evaporator coil inlet. Coil inlet also within the valve. The problem is that real overheating, should be assessed based on pressure, where overheating of the engine. In remote sensing lamp, pressure 69.0 PSIG 10 psi = 59.0 pounds per square inch. The saturation temperature that corresponds to that pressure is about 33F. thus, 50F the actual temperature of the gas in the bulb is 17F overheating (50F - 33F)10F, as originally intended. This means that too many coil is used to overheating of the refrigerant. This causes the evaporator operations become ineffective, and possibly short cooling capacity. 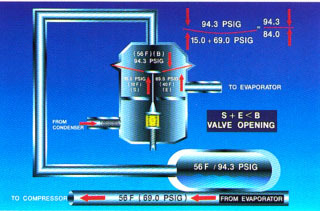 Externally-equalized seal valve evaporator inlet from the lower and the pipe outlet pressure. Pressure and temperature, located in the same place with the help of external equalizer line and sensing bulb, respectively. This design allows overheating be accurately maintained regardless of the pressure drop through the evaporator. This design also allows you to use the entire surface of the evaporator, thereby increasing its heat transfer efficiency.